My latest fitness ambitions have been triathlons (where you swim, bike, then run for those of you that don’t know). Feel free to follow me on Strava or Garmin. Over the years, I’ve had a few fitness posts. For the cycling portion, one of my recent purchases has been the new Garmin Edge 520 Plus Cycling GPS Computer. Garmin recently launched the Garmin Edge 520 Plus as a way to bring the older Garmin Edge 520 Bike GPS closer to the Wahoo ELEMNT and Wahoo Elemnt Bolt. Garmin also has their own more expensive touchscreen cycling computers in the Garmin Edge 820 and Garmin Edge 1030 Cycling Computer , which have been known to have their own sets of issues. If you’re like me, you’re probably looking at a mid-range cycling computer that offer the most bang for your buck. I actually ordered both the Garmin Edge 520 Plus and the Wahoo ELEMNT > so that I could compare both. The Wahoo has a big following in the online communities, but it also had some downfalls that I was hoping the Garmin would make up for. Some people have been frustrated with the Garmin lineup and for many years Garmin didn’t have much competition to deal with. The Garmin Edge 520 Plus has the same training features as the other Garmin lineup like measure and track Functional Threshold Power (FTP), VO2 Max, etc. The Plus adds Garmin Cycling Maps which offer turn-by-turn directions as well as sharp curve alerts. We’ll detail the navigation part in a bit. The Garmin Edge 520 Plus also features Incident Detection, Group Track, Live Track, Rider-To-Rider Messaging, and with the latest firmware, Extended Display. According to Garmin, the battery life is supposed to be up to 15 hours, but that’s by during lots of features off like having the backlight at 0%, not using navigation and limiting the number of sensors you have connected. The Wahoo devices have been known to have excellent battery life compared to the Garmin devices. I’ve only used the 520 Plus on a few rides and I think it’ll be fine depending on what your needs are. The new Extended Display feature is interesting if you’re the owner of a Forerunner 935 or Fenix 5 Series watch. It basically allows you to pair your watch with your Edge and display the information from the watch onto the Edge’s screen. This is particularly useful if you’re in a triathlon and are using the Triathlon mode on your watch. For the bike leg, just setup Extended Display and you can see your watch data on your screen instead of recording it as a separate ride. My biggest complaint so far with Extended Display is that it takes quite a few key presses to turn it on. You have to navigate to Settings > Sensors & Accessories > Add New > Extended Display on the 520 Plus after pairing your watch. It would be nice if it could be in the profile menu when you start a ride. Now for the section you’ve all been waiting for. How does navigation work on the Garmin Edge 520 Plus ? Well, that depends. Not much of an answer, but it is true. For those of you familar with the Wahoo ELEMNT , you’ll know that you need to use the phone companion app to create routes and save them to the Elemnt. Some people hate that idea, but Wahoo’s implementation is actually good and always just worked when I tried it. The Garmin Edge 520 Plus on the other hand requires you to have routes in Garmin Connect or use a Connect IQ app to load routes. You can create routes (courses) on the Garmin Connect website and get them to sync to your device, but what about if you need to create a route, or change a route while you’re not near a computer? Unfortunately, Garmin’s Connect Mobile app falls short for course creation. You can put a starting point on a map and tell the app how many miles you want to ride, but you have no input on the actual route. Hopefully Garmin will change this in future updates. On the plus side, there are a few Garmin Connect IQ Apps that offer better route creation tools that integrate nicely. You can also load Strava Routes through the Strava Connect IQ App. The Garmin Edge 520 Plus also doesn’t include a Points Of Interest (POI) database or address routing. There’s no way to enter a location on the device and have it calculate a route. If you want this feature on the device, you would need one of the higher end Garmin devices. The Wahoo ELEMNT also doesn’t offer this on the device itself, but lets you navigate to specific locations through the phone companion app. The Garmin Edge 520 Plus does however let you route to a saved location. For example, you can save your home address on the device and have it create a route back to that address from the device. You can also use third party apps via Connect IQ to route to a POI database like Yelp. I’ve also reached out to Komoot which offers a phone companion app for route creation and a Connect IQ app to sync and they’ll hopefully release an update soon that supports the Garmin Edge 520 Plus . One of the biggest advantages for the Garmin Edge 520 Plus over the Wahoo devices is the Connect IQ App Store. Some of the apps are basic, but it gives the user options and various ways to get the functionality they’re looking for from the device. The Garmin Edge 520 Plus also supports off-route re-routing, which the Wahoo doesn’t do. 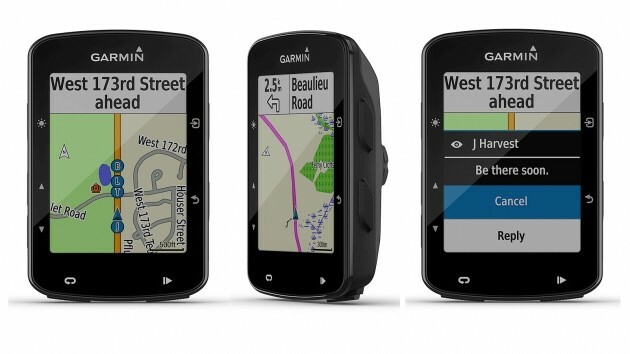 The Garmin will detect when you’re off your route and will re-calculate directions to get you back onto the route. The downside to this is that some people have experienced delays in this route re-calculation. It has taken my device 1-2 minutes to calculate a route, but I’ve read where it has been 5-10 minutes for some people. Hopefully Garmin will address this in a future update. If you currently own a Garmin Edge device, then the Garmin Edge 520 Plus might not be for you since it doesn’t offer any new ground breaking features. If you’re like me and are looking for your first cycling computer, then the Garmin Edge 520 Plus is definitely one to take a look at depending on your budget. Even though the route calculation can take a while, it is a worthwhile feature if you’re riding in an area you’re unfamiliar with. Buy the Garmin Edge 520 Plus on Amazon!